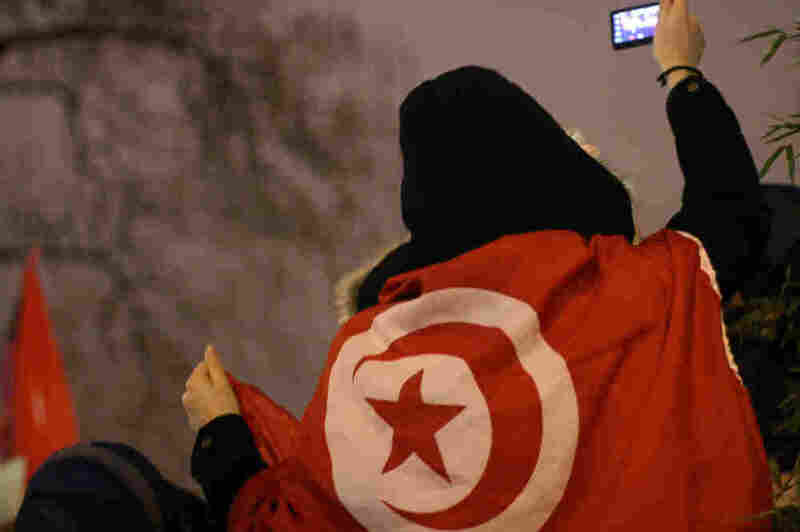 Online Reports Detail Chaos, Deaths In Tunisia; Add Yours : The Two-Way As protests spread across Tunisia, we’re collecting social media from people on the ground. In this experiment by NPR’s social media desk, you can help us examine this citizen journalism and sort out the facts. A woman uses her mobile phone to take a picture of a rally in Paris in support of protesters in Tunisia. Protests have spread across the North African nation of Tunisia, challenging the 22-year-old regime of President Zine El Abidine Ben Ali. The crisis began three weeks ago, when a 26-year-old man set himself on fire to protest the confiscation of his fruit car by police in the town of Sidi Bou Zid. Townspeople soon took to the streets to protest the lack of economic opportunity. In the ensuing days, more protests erupted across the country, many of them morphing from economic protests into challenges directly against President Ben Ali. Quoting human rights groups, the New York Times puts the death toll at 30; Reuters reports the number of civilians killed is 23. Some of us have called the situation in Tunisia a "jasmine revolt," as jasmine flowers are a national symbol in Tunisia. Public dissent is almost unheard of in Tunisia, where free speech and free assembly are routinely quashed by authorities. Many of these protests have been met with force by Tunisian police, and because of the dearth of Western jounalists on the ground, a great deal of the reporting is coming directly from protesters on Facebook, Twitter and other social networks. In the last 24 hours, protests reached the capital, Tunis, which was placed under mandatory curfew last night. I've been documenting the events of the last three weeks using a curation tool called Storify. I've pulled together videos, texts, tweets and other content produced by citizen journalists and others on the ground in Tunisia. As is almost always the case in the time of a revolt, the situation is very fluid and accurate information can be hard to come by. In the same way that social media captured the chaos of the protests in Iran, tech-savvy Tunisians are capturing moments of dissent and violence, though sometimes without a lot of context for those of us not in Tunisia. So please see this Storify collection as a work-in-progress that needs your assistance, rather than a definitive report on what's happened in Tunisia. I would really appreciate it if you would join this experiment. If you have online materials related to this "jasmine revolt" that aren't in our Storify collection already, please let us know in the comments, and feel free to link to them. One way to find the latest information is to monitor the Twitter hashtag #sidibouzid. And if you're an Arabic or French speaker, you can also go through the materials we've already collected and help us translate them. If you do this, please be sure to note exactly which piece of content you're translating. We also encourage you to review other people's translations to see if they're accurate. One last note: consider yourself warned that some of the videos are extremely graphic, so you should decide for yourself whether you want to watch them. I've tried to label each video individually to give you a head's up if that's the case.